In modern times, clinicians are marked by crisp white coats and scrubs come in a variety of colors, patterns, and styles. But did you know that every color used in medical apparel, whether scrubs or lab coats, has its own unique history and purpose? Physicians have historically dressed in black clothing, for two reasons. The first reason is that black has long been considered formal, and medical matters are certainly a formal matter deserving of respect. The second, more obvious reason is that black better hides stains, bodily fluids, and dirt. Around the early 19th century, modern germ theory began to circulate, leading to an uptick in hygiene and sanitation. Patients stopped dying (as often, at least) on the operating tables and physicians became more trusted by society. Before physicians and surgeons rose to the ranks of highly esteemed professions, they were mostly regarded as glorified butchers. As physicians gained a better understanding of how bacteria were spread, white became the hue of traditional physician garb. 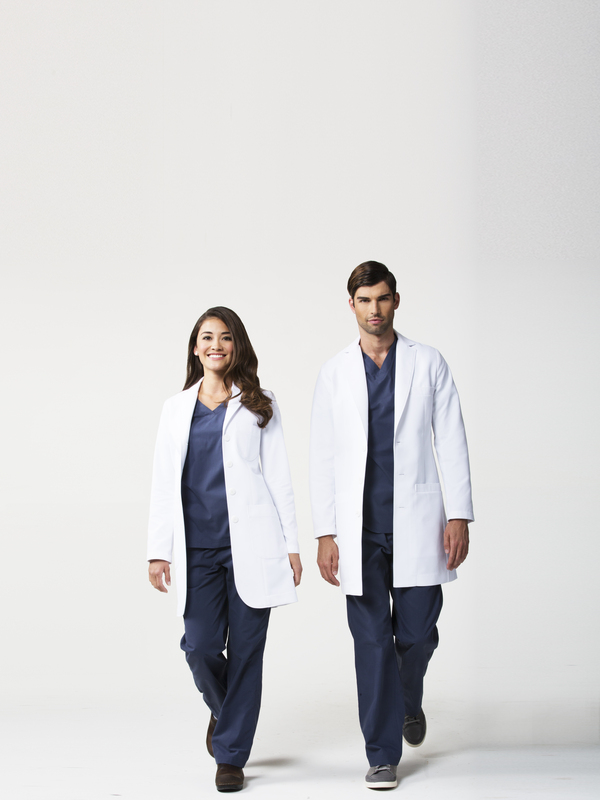 White is representative of cleanliness and purity, two characteristics that all physicians were meant to embody. Medical scrubs were originally white as well, for the same reasons. However in the 1950’s hospitals began to phase out white scrubs in favor of scrubs in green tones – these colors are easier on the eye and allow for a visual contrast between the stark white color of the lab coats worn by physicians. Today, trends in medical apparel have geared toward the function for the user. Performance fabrics have taken over the industry as the increased durability and technological features create garments that are more appropriate for the busy lifestyles of modern medical professionals. Scrubs color has shifted to be a matter of personal preference, but the crisp white lab coat continues the be a symbol of a doctor’s professionalism and prestige. This entry was posted in Lab Coats, Medical Scrubs, Trends In Medical Apparel and tagged lab coats, Scrubs, Trends on February 16, 2016 by Ariel Jacoby.